First published in Sawubona Magazine (February 2015 edition). After a day of pounding pavements in the overcrowded sauna that is Hong Kong, you could be forgiven for contemplating a retreat to some sedate air-conditioned refuge. Or rather – that might be your expectation from afar. The electric reality though is that despite its tropical climate this city is overflowing with an infectious energy that the shirt-sticking, brow-slicking humidity just can’t restrain. You’ll soon be craving to paint the town a balls-to-the-wall shade of garish Chinese red. As my friend Jim, a legendary party guy, might have said: the east is a feast, get here and we’ll let out the beast. Here are a few suggestions – tried, tested and trusted – for when (not if) the mood strikes. Brace yourselves. Ozone, perched on the 118th floor of the fabulous Ritz Carlton in Kowloon, is apparently – not that I doubt it – officially the world’s highest bar. The mainland may be less fashionable but you wouldn’t think it here. With viscerally glam décor by Japanese design house Wonderwall, with a bar selection that commands both the premium and the niched, and with wrap-around views of the peninsula – the boats, the mountains, and the skyscrapers merging with the blue sky – that from this astronautical height are palpitating, sinking sundowners in this place is an indelible, knock-your-socks-off experience; no matter who you are or where you’ve been you will be impressed. I was particularly enamoured with their gin and tonic promotion, consisting of eight combinations of different gins and different tonics, and a variety of garnishes and additional ingredients ranging from Acacia honey to green tea syrup. Whiskies too feature in pleasing proportion – I counted 48, including six Glenlivets. Alchemy, in the unhinged Central district of Hong Kong island, where it all goes down, has styled itself as a “gastronomic lounge”. An apothecaric alcove at the entrance appears to be a dead end, before a sliding panel opens to grant you access. It’s a nice touch that sets the chic tone maintained throughout. The emphasis is culinary, but that doesn’t mean you get short-changed elsewhere – quite the opposite. The bar is stocked with the usual generous assortment of premium spirits that I came to expect in Hong Kong, it demonstrates a passionate proficiency in the making of mojitos with its offering of ten different varieties, and it also holds a few surprises up its sleeve – notably a couple of options of Calvados, rare outside of France, and an uber-cool bottle of Chivas Revolve. Their “treble” notwithstanding, Alchemy is all about that bass. A three-star Michelin chef caters a tapas menu for the loungers, but the serious action takes place in the basement: dining in the dark (! ), the idea being to augment your sense of taste by depriving you of your sight. Intriguing. 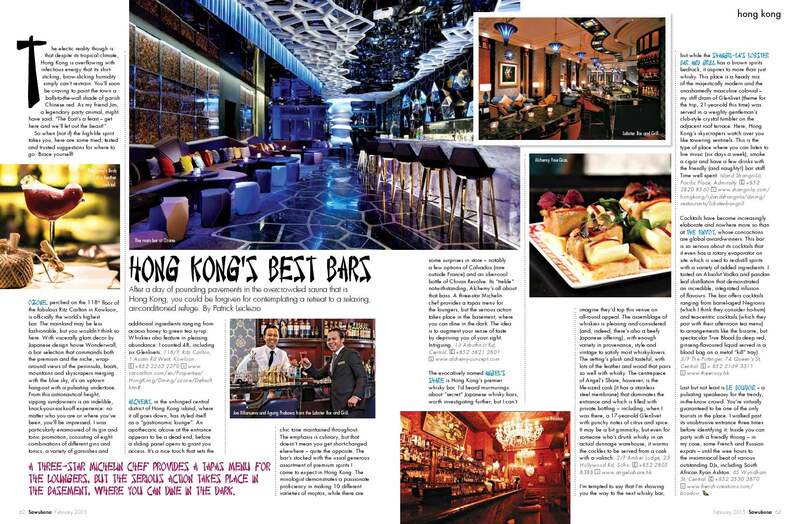 The evocatively named Angel’s Share is Hong Kong’s premier whisky bar. I’d heard murmurings about “secret” Japanese whisky bars, worth investigating further, but I can’t imagine that they’d top this venue on all-round appeal. The assemblage of whiskies is pleasing and considered (and indeed there’s a beefy-ish Japanese offering), with enough variety in provenance, style, and vintage to satisfy most whisky lovers, and the setting is plush and tasteful, with lots of the leather and wood that pairs so well with whisky. The centrepiece of Angel’s Share however is the cask, life-sized but not live (it has a stainless steel membrane), that dominates the entrance, and which they fill with private bottlings – on this occasion a 17YO Glenlivet, with punchy notes of citrus and spice. It may be a bit gimmicky but even as someone who’s drunk whisky in an actual dunnage warehouse it warmed the cockles to be served from a cask with a valinch. I’m tempted to say that I’m showing you the way to the next whisky bar but whilst the Shangri-La’s Lobster Bar and Grill has a brown spirits bedrock it aspires to more than just whisky. This place is heady mix of the unashamedly masculine colonial – my stiff dram of Glenlivet (theme for the trip, 21YO this time) was served in a weighty gentleman’s club style crystal tumbler – and the majestically modern – on the adjacent roof terrace Hong Kong’s skyscrapers watch over you like towering sentinels. This is the type of place where you can listen to live music (six days a week), smoke a cigar, and have a few drinks with the friendly (and also naughty!) bar staff. Time beautifully filled. Cocktails have become increasingly elaborate and nowhere more so than at The Envoy, whose concoctions are global award winners. This bar is so serious about its cocktails that it even has a rotary evaporator on site which is used to redistill spirits with a variety of added ingredients. I tasted an Absolut Vodka and pandan leaves distillation that demonstrated an incredible, integrated infusion of flavour. The bar offers cocktails ranging from barrel aged Negronis (which I think they consider ho-hum), and tea-centric cocktails (which they pair with their afternoon tea menu), to arrangements like the bizarrely spectacular True Blood (a deep red, ginseng flavoured liquid served in a blood bag on a metal “kill” tray). Last but not least is Le Boudoir – a pulsing “speakeasy” for the trendy, in-the-know crowd. You’re virtually guaranteed to be one of the only tourists in the place. I walked past its unobtrusive entrance three times before identifying it. Inside you can party with a friendly throng – in my case some French and Russian expats – into the early hours to the insomniacal beat of various outstanding DJ’s, including South African Ryan Ashton. This entry was posted in Spirits column and tagged Hong Kong. Bookmark the permalink.